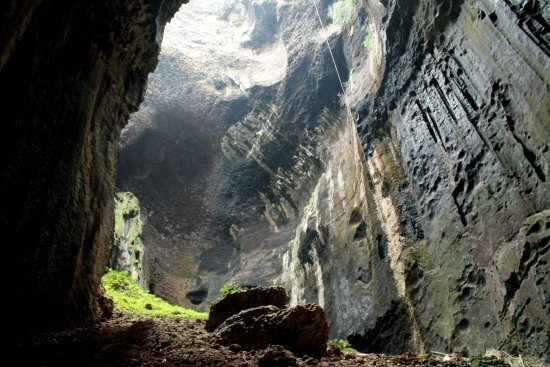 For centuries, the caves have been renowned for their valuable edible swiftlet nests, which are harvested for bird's nest soup. The most valuable of the nests, the white ones, can sell for very high prices. The birds' nest collection is an ancient tradition, and the trading of these nests has been done since at least 500 AD. 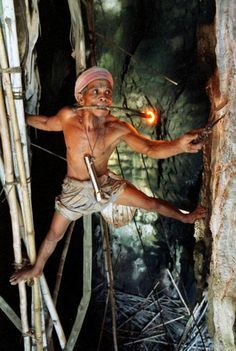 Twice a year, from February to April and July to September, locals with licenses climb to the roof of the caves, using only rattan ladders, ropes, and bamboo poles, and collect the nests. The first collection takes place early in the breeding season before the swiftlets lay their eggs. The birds then make another nest in which they finally lay their eggs. After the young have fledged, the second collection is made. Care must be taken to assure that the nests are collected only after the young swiftlets have abandoned these nests. These individuals are very much in demand by the people and communities that hold the Government's harvesting licenses. Edible birds' nests are protected under the Wildlife Conservation Enactment of 1997. Heavy fines and penalties are imposed on unlicensed collectrs. The main cave system is divided into two parts: the more accessible Simud Hitam (Black Cave), and the larger Simud Putih (White Cave) which lies above. The names refer to the main type of nests produced by swiftlets in each cave. The cave system is home to many other animals, including massive populations of cockroaches and bats. Outside one can see many raptors including crested serpent eagles, kingfishers, and Asian fairy-bluebirds. The presence of other wildlife such as orang- utans, “lotong merah”, Hornbills, apes and monkeys in/near the cave is something familiar. The nests are made from the saliva of swiftlets, small birds which inhabit the Gomantong Caves. Every year, the nests are harvested in the months of February, April, August and December, after the chicks have abandoned the nests. Bird nest harvesting from the caves is a dangerous, but lucrative industry and Sabah’s Gomantong Caves is one of the biggest, natural bird nest sites in the world. I think they’re worth more than gold from memory (the birds nests).